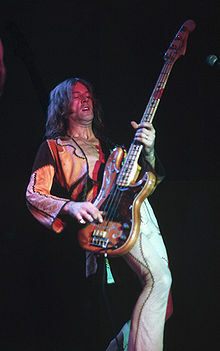 Alfred Gregory "Greg" Ridley (23 October 1947 – 19 November 2003) was an English rock bassist and a founding member of Humble Pie. Ridley was born in Carlisle, Cumberland, England. Early in his career he played under the name Dino as guitarist for "Dino & the Danubes" before joining bands such as the Ramrods. Ridley and Mike Harrison formed The V.I.P.s in 1963, playing blues based music. The band added guitarist Luther Grosvenor and organist/pianist Keith Emerson, who stayed for a brief period of time before leaving and forming The Nice. After they changed their name to Art and published an album Supernatural Fairy Tales, and then to Spooky Tooth in 1968. Spooky Tooth signed to Island and recorded two albums It's All About Spooky Tooth (1968) and Spooky Two (1969). In January 1969 Ridley was approached by Steve Marriott from the Small Faces - who was forming a new band, called Humble Pie. The line up also included guitarist Peter Frampton from The Herd and drummer Jerry Shirley. Humble Pie's first album As Safe As Yesterday Is was released and a second album Town and Country was also released in the same year. A contract with A&M Records and a re-working of their sound into a harder brand of music, coupled with extensive touring of United States followed. A double album Performance Rockin' the Fillmore, featuring a now historic recording of a raw performance of rare quality, catapulted Humble Pie into rock history. Ridley's powerful bass playing anchored the band's performance and was at the centre of their sound. Together, Ridley and drummer Jerry Shirley comprised one of the most respected rhythm sections in Rock music during this period. Although Ridley rarely sang lead vocals, his deep baritone was frequently used to provide contrast with the higher tenors of Marriott and Frampton. Ridley made several songwriting contributions, including "Sucking on the Sweet Vine" on Humble Pie, "The Light of Love" on Town and Country, and "Big George" on Rock On. This incarnation of Humble Pie continued until 1975 and Ridley left the music business, after finishing an unreleased album with Marriott and abortive attempts with bands such as Mike Patto and Ollie Halsall's band Boxer. Ridley moved to Gloucestershire and lived in a stone cottage in the Forest of Dean with his girlfriend. He found the peace and quiet of country life a pleasant and refreshing change to touring and recording. He became involved in the antique furniture business and throughout the 80's he was a low-key antique trader and he stripped pine furniture for other traders as a business. On 14 April 2001 he appeared with Jerry Shirley, Peter Frampton and Clem Clempson, billed as a one off Humble Pie re-union, at a Steve Marriott Tribute Concert. Earlier that year, he had also become involved with a Humble Pie project initiated by Jerry Shirley's reactivation of the group. and the enlisting of another former Humble Pie guitarist and vocalist Bobby Tench. This resulted in the album Back on Track, released by Sanctuary in 2002 and a short tour of Germany with Company of Snakes during the early part of 2003. The project was cut short when Ridley became ill.
On 19 November 2003, Ridley died in Alicante, Spain, of pneumonia and resulting complications. He was 56. His funeral was paid for by a concert organised by harmonica player Dave Hunt. ^ a b "Biography (page 2)". Greg Ridley Official Website. ^ Steve Huey. "Spooky Tooth biog". Allmusic.com. Retrieved 4 December 2009. ^ Allmusic. "Spooky Tooth credits". Allmusic.com. Retrieved 4 December 2009. ^ "Astoria concert 2001". humble-pie.net. 24 April 2001. Archived from the original on 22 January 2009. Retrieved 14 February 2009. ^ "Biography (page 4)". Greg Ridley Official Website. ^ "Biography (page 5)". Greg Ridley Official Website. This page was last edited on 3 February 2019, at 16:33 (UTC).